OMD’s history in print has been surprisingly bare considering the band have been active for 4 decades. The first book to emerge was the unofficial biography, arriving in timely fashion during the band’s Architecture & Morality period in the early 1980s. OMD fans then had to wait until 1987’s Messages book, which presented the band’s first official biography (co-authored by journalist Johnny Waller and Paul Humphrey’s brother Mike) for a lengthier history of the band. Now with new publication Pretending To See The Future, a book arrives that offers a more comprehensive window on OMD’s 40-year history. Along the way, it pulls in commentary from band members, assorted colleagues from their past (and present), guest writers and also the fans themselves. 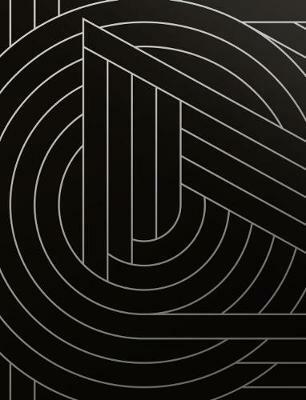 As a result, the book is a hybrid affair that presents an oral history of the band combined with a fascinating visual archive of OMD’s extensive musical history. The early Wirral period opens a window on the initial musical endeavours of Andy McCluskey and Paul Humphreys, including the evolution of bands such as The Id. This includes contributions from people involved with the band at the time, including Julia Kneale (whose own book Moods, Memories And Other Manoeuvres touched on aspects of this pre-OMD history). The fledgling days of OMD’s tentative explorations into the world of electronic music offers insight into how Andy and Paul wrote classic tunes on basic equipment. It looks at the role of OMD’s then-manager Paul Collister and the usefulness of his reel-to-reel tape recorder ‘Winston’ (which became the ‘third’ stage member for OMD’s live shows at the time). The visceral thrill of the band’s early successes via singles ‘Messages’ and ‘Enola Gay’ is covered in depth and OMD’s phenomenal Architecture & Morality period gets an equally expansive exploration. With the band achieving household name recognition, the stories from the time also show they were aware of being part of something bigger evolving before their eyes. The book also doesn’t skimp on input from some well-known figures from OMD history. Peter Saville, whose design talents went hand-in-hand with OMD’s smart synthpop aspirations, gets some particularly good exposure on his thoughts on the band (“Their music was hi-tech and technology was informing the shape of the things around us and how we were living.”). But there’s also input from the likes of Carol Wilson, Dave Hughes, Hambi Haralambous, the Weir Brothers and Nigel Ipinson among others. All with unique perspectives on OMD and the part they played in the story. The book also features some thoughts from a host of surprising guest contributors, including Stephen Morris, Phil Oakey, U2’s Adam Clayton, Neil Tennant (“When Chris Lowe and I first met in 1981 there were two electro-pop singles we both loved: ‘Bedsitter’ by Soft Cell and ‘Souvenir’ by OMD”), Vince Clarke (“‘Electricity’ is a classic pop song, simply but perfectly arranged”), Gary Numan, Karl Bartos and Howard Jones (who first encountered the Emulator care of OMD when supporting them in 1983). Interspersed between this oral history are plenty of stories from OMD fans across decades of following the band. Some of the submitted stories are quite profound and touching at times, demonstrating (often in raw detail) the power of music in people’s lives. If people are dismissive about how music can have an effect in the real world, many of the stories in this book will counter that view. OMD’s history is, of course, marked by a lot of significant events and Pretending To See The Future manages to focus on many of these stories in detail. The creation of ‘If You Leave for the Pretty In Pink soundtrack gives readers a first-hand view of OMD’s US success efforts. OMD’s legendary Rosebowl support slot for Depeche Mode in 1988 remains one of the band’s live highlights (Andy: “I was so nervous for the last concert of the Music for the Masses tour (in front of 70,000), that I crawled behind the sofa in the dressing room so no-one could find me, falling asleep until 15 minutes before stage-time.”). The unfortunate splitting of the band towards the end of the ’80s also features contemporary reflections from Andy and Paul. Meanwhile, the harrowing details of the stage incident in Canada in 2013, which saw Mal Holmes rushed to hospital, also gets explored. 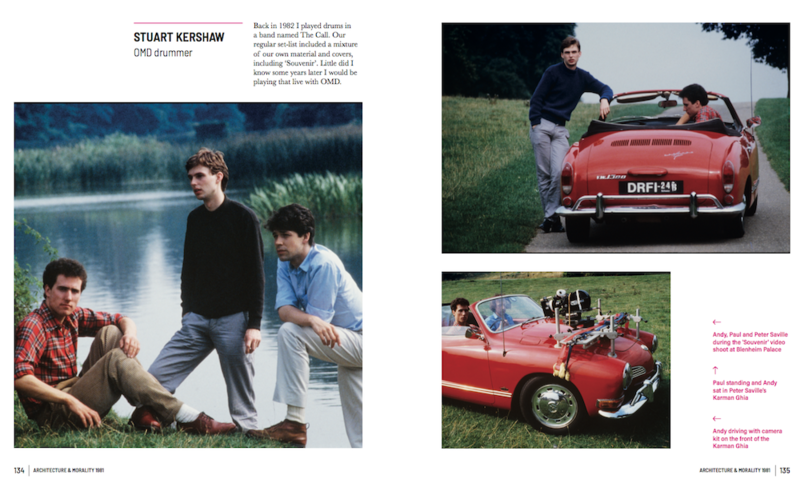 Visually, the book presents many previously unseen photos and scans from the OMD archives. If you were ever keen to see models of the mock-up for the stunning Dazzle Ships stage setup or illuminating sketches for sleeve designs, then this book delivers. Equally, there’s a ton of scans that feature early OMD promo artwork and hand-written notations on many classic OMD songs. The book isn’t without its shortcomings however. A few spelling errors are lurking (the book was in the process of being edited right up to the publication date). The Liberator and Universal periods oddly don’t get the same coverage as other OMD albums. Also, the fan community of the 1990s – and the genesis of the Official OMD Website – are also completely absent. The option to go for an oral history also means there’s no authorial voice for the book as a whole. As a result, there’s a few moments where some elements of the book have frustratingly little context to show some OMD stories and images against a broader canvas. The inclusion of an index or comprehensive discography to bookend the publication would have also helped to round things up nicely. Despite these issues, the pros easily outweigh the cons. The sheer weight of material contained across 470 pages will more than satisfy OMD fans. 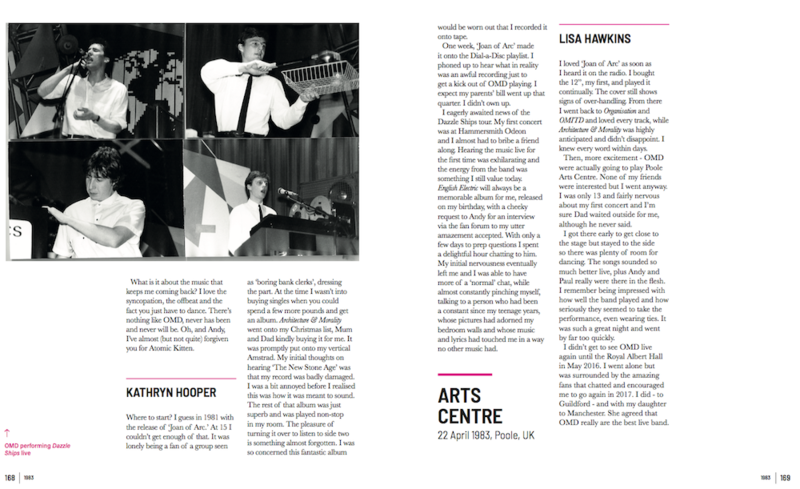 There’s also revelations and images within the book that are sure to spark debates and conversations for years to come (it does seem to put to bed the long-running debate over when the first OMD live performance takes place, as an example. Or does it?). Pretending To See The Future by Richard Houghton is due out on 29th November 2018 via This Day In Music Books.